Note: Always unplug any appliance before making a repair to avoid being electrocuted “it can kill you”! At some point if you have had an electric dryer long enough you will run into the problem where your electric dryer runs but doesn’t heat up to dry the clothes. I will go over some of the more common issues that cause this problem. The first thing you want to do before even looking at the dryer is check the voltage at the dryer where the dryer plug is connected to the dryer terminal block. The dryer must be supplied with 220/240 volts for it to heat. Just because the dryer motor is running, don’t let that fool you, the dryer can run as long as it’s getting 120 volts supplied to the motor so you could have a bad dryer wall plug that is only allowing 120 volts to the dryer or it could be a bad dryer plug or the breaker itself. Chasing down the electrical problem in your home is another matter for another time. Just verify that you have 220/240 volts being supplied to the dryer before proceeding. All electric dryers have a heating element or “coil” that when supplied with 220/240 volts heats up and supplies the heat in the dryer, as the motor runs it turns a blower wheel that forces the hot air to circulate in the dryer and if that air flow is disrupted in any way the hot air backs up in the dryer and causes several problems. This can happen if the exhaust vent of the dryer is clogged with lint or the vent is kinked or pinched. 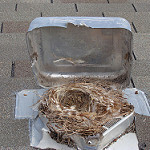 It can also be that the vent duct on your home is clogged with lint, in some cases where vents go up through the roof it could be that a bird has built a nest where the vent exits the roof. 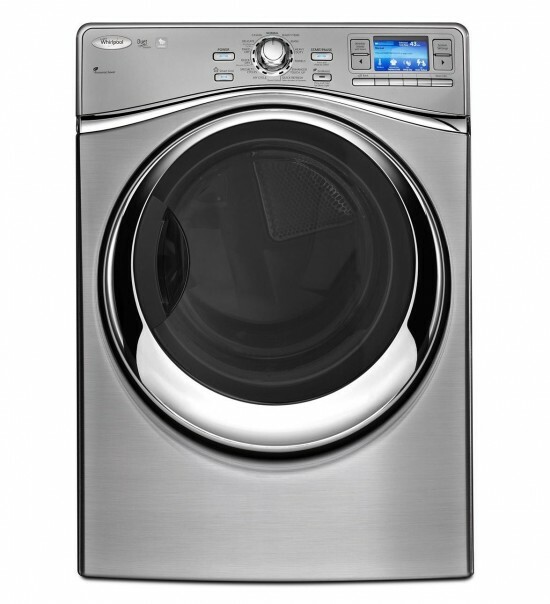 The first problem it causes is that the dryer will take forever to dry the clothes properly because its causing the heating cycle to go off and on so fast that the heat is not being supplied in the unit for long enough periods of time this is called “short cycling” when this happens the dryer can overheat. 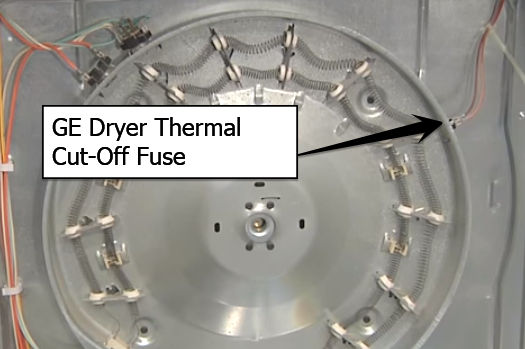 When the electric dryer gets to hot it trips a “safety fuse” called a thermal cut-off fuse, this is a safety feature built into the dryer to keep it from over heating, they usually have a operating temperature of around 300 degrees Fahrenheit, once the temperature goes above that the fuse will trip. Once the fuse has tripped it is not re-settable and will not allow voltage to the heating element so it has to be replaced before the dryer will heat again. 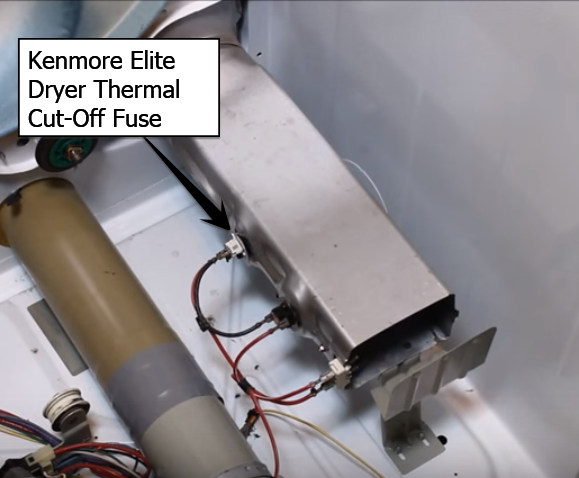 There is also another fuse just called a thermal fuse but it’s out of the scope of this article because if it had tripped the dryer would not run at all. The continuity of the thermal cut-off fuse can be measured with a ohm/voltage meter. It should have continuity. The location of the thermal cut-off fuse varies from dryer model to dryer model but it will be located on the heater element housing as shown in the pictures below. If the thermal cut-off fuse checked out ok then you need to have a look at the heating element itself, they can break from time to time and it is very common for them to go out. The heating element also shown in the images above can be checked for continuity with a meter. Pull the wires off the heating element and check the two terminals of the heating element with a meter if it does not have continuity it is bad and you need to replace it. If it has continuity also check that it is not grounded (meaning it broke inside the housing and now the wire is grounded to the element case) put one lead on a terminal of the element and one on the metal of the element case if it shows continuity the element is grounded and needs to be replaced. 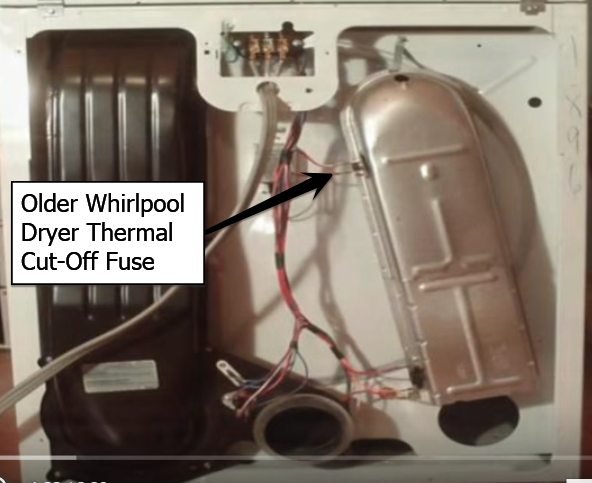 If your electric dryer runs but doesn’t heat and would like to make this repair yourself but are not quite sure how to we can help, click on the live tech help button at the bottom right of your page or visit our tech help service page for more information.